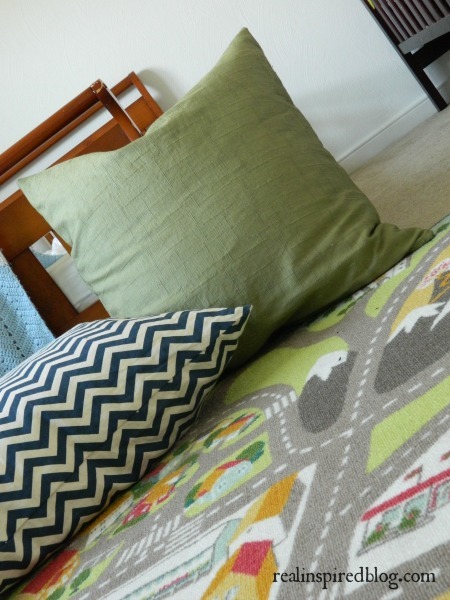 Back almost a year ago when I started planning the new nursery, I knew I wanted some child-size floor pillows. 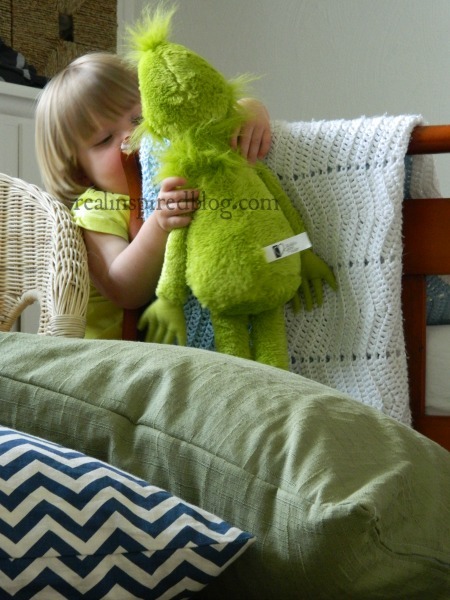 Kids are always playing on the floor and it just seemed right to give them some big comfy pillows to lounge on. Since navy and green was the decided upon color scheme, I kept my eyes out for some cool solid or patterned material that I could make into pillow covers. I found a great green tablecloth at the thrift store that was perfect! I used some of the material for a Christmas pillow and, after the floor pillow, I still have enough for one more for around the house. 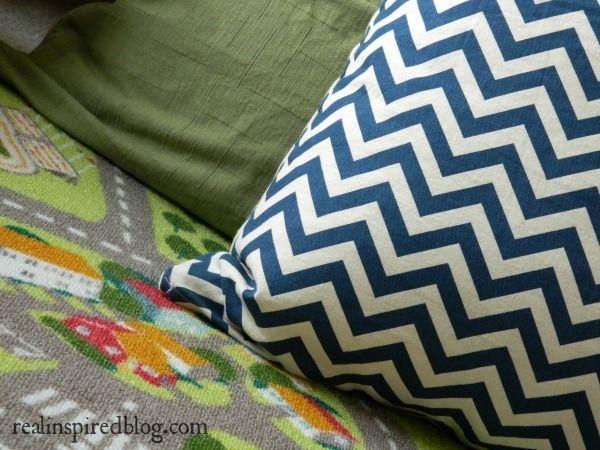 For a second floor pillow, I chose a cadet blue chevron stripe that I found at Hancock Fabric. Because children will be laying on them and making them flat, I decided to buy feather inserts for my covers so I could fluff them. And if I decide that I'm finding way too many little feathers that little hands have pulled out, I can just switch out the inserts. Because I bought them cheap at Ikea. I think both 26"x 26" feather euro pillows were about $15 each. 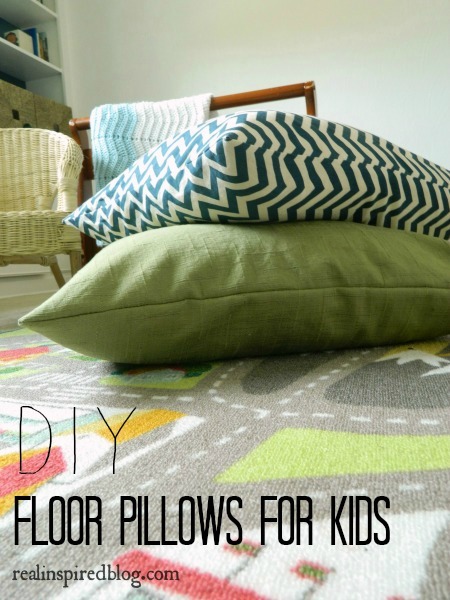 To make my little kiddie floor pillows, I followed this great tutorial from Vintage Revivals. I only cut my material an inch bigger than my inserts to allow for a seam. I didn't want my covers too roomy. Just ignore my not matched up pattern at the seams. I'm pretty sure that's a feat of magic, lining up prints when you sew. I doubt I will master it anytime soon. But, if I'm not analyzing other people's pillows at their houses, they must not be analyzing mine when they're at my house. There is beauty in imperfection and they are made with love. At least that's my rationale. In reality, I struggle to sew a straight seam. I'm hoping I'll get better with practice but I think I'm a hopeless case of impatience. I can't wait until this nursery is completely finished and I can show it to you! We're working on purchasing a storage system for toy organization, hanging a gallery wall, and finishing up the curtains. Once those are checked off the list, just you wait! It's gonna be awesome!